If you know anyone who doesn’t wish they could have a real lightsaber, expel that poor soul from your social circle immediately and advise them to seek professional help. The lightsabers is the coolest fantasy weapon ever conceived, period. Alas, The History Channel’s Star Wars Tech made it emphatically clear light could not be made to form solid blades to be used as swords. Well, reality has never stopped fans from dreaming, and it obviously hasn’t stopped Wicked Lasers from attempting the impossible. Behold, boys and girls: The LaserSaber! 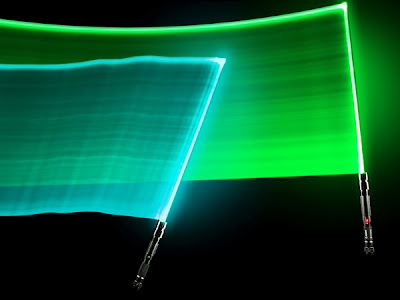 The specs for the LaserSaber make it seem even more dangerous than a light saber would be in real life. It consists of a 32” polycarbonate blade hitched to a hilt made out of aircraft grade aluminum. The commercial purports it to be the most powerful laser one can legally own. It shines brightly even when the lights are on. Users have to wear special shades so as not to be blinded by it. The commercial advises against using these things in pretend swordfights with friends, making them utterly useless. It’s a toy that’s too dangerous to play with. What the hell good is that? *Thanks to JoBlo for the scoop.